Let me introduce you to our new favorite meal. When I told Eddie that I was making chicken tamale pie, he looked at me skeptically because he had no clue what it was. The minute the words “cornbread base” came out of my mouth, he was all SOLD! before I even could tell him what else was in the dish. Really, this skillet here is made up of every single thing that he loves and mostly of what I love too. Going to eat it forever. Okay bye. Now, it’s not the prettiest dish when served. There is really no way to serve this warm without it appearing to be a slop-pile mess. But that doesn’t take away from the deliciousness. Also, can we please take a moment for the cheeeeeeeeeese. So here’s the thing. 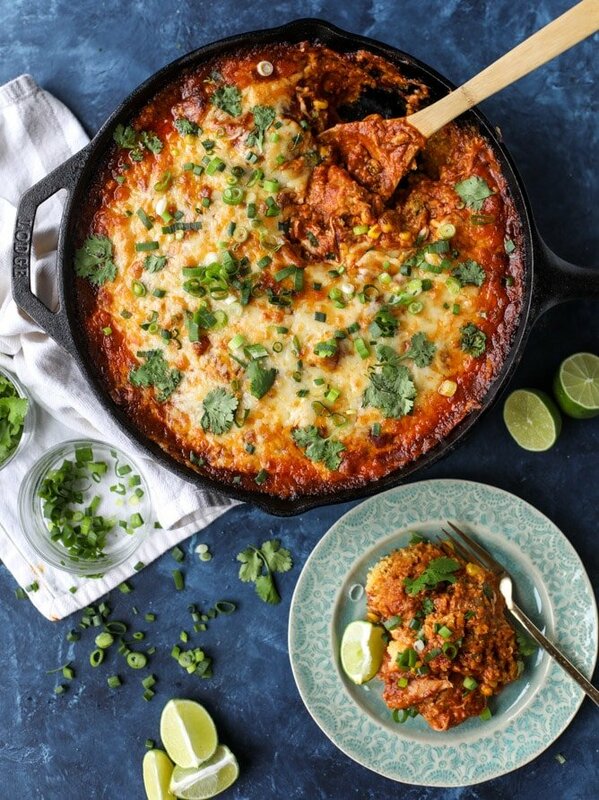 This tamale pie is a little on the high maintenance side. It doesn’t have to be. But this one has a homemade cornbread base AND a homemade enchilada sauce. Neither take a long time to make, but there will be multiple dishes adding up in the your sink, FYI. Most tamale pies I’ve seen in the past are made from a cheater’s version which seems completely acceptable to me if you are in a rush. Boxed cornbread, canned enchilada sauce, rotisserie chicken – and boom, you’re done. If you’re dreading dinner and have to go to the store anyway, you can grab all of those things and throw this together as such. For me, I never have cornbread mix on hand but I do always have ground cornmeal. This homemade enchilada sauce has completely RUINED me because I can no longer use canned sauce (nor do I want to) and it really only takes 10 minutes. It is so freaking flavorful! The ingredient list looks long but it’s mostly made up of spices that go in the sauce – traditional “taco” ones that you most likely have in your pantry. If you’re missing something like smoked paprika or cayenne, leave it out! No biggie. I’d say the chili powder and cumin are the biggest game players so as long as you have those, you’re golden. And then for the chicken? Well, rotisserie can totally work. I had some leftover shredded chicken breasts from making a Thai chicken soup a few days before (OMG was it ever good… will tell you about it soon!) so I already had that. The only other secrets I used? Canned green chiles and the roasted corn from Trader Joe’s. Since we can’t find ears of corn anymore, the roasted corn totally took its place and it was fabulous. Sometimes that corn can almost taste like an ashtray or something, but as long as you use just a bit, it’s amazing. This combination is seriously straight out of my dreams. As for the rest? You can totally make it your own! Add black beans if you want and serve it with rice if you want something more, but really this is a complete meal right here in this skillet. It’s crazy filling and satisfying and total comfort food. After we ate dinner, I told Eddie that I can see this being a meal that I make once every two weeks until next Spring, because we loved it THAT much. Bonus: it also reheats really well too. YESSSSSSSSSSSS. Annnnd now you totally know what’s for dinner tonight! 1/2 cup cooked corn I used the roasted corn from Trader Joe's! Heat a large saucepan over medium heat and add the olive oil. Whisk in the flour and cook until it is golden brown, about 2 minutes. Add the remaining ingredients and whisk together, bringing the mixture to a simmer. Reduce the heat to low and cook for 5 more minutes before using. In a large bowl, whisk together the flour, cornmeal, baking powder, sugar and salt. In a smaller bowl, whisk together the melted butter, milk and egg. Stir the wet ingredients into the dry until just combined. Fold in the corn and the cheddar cheese. Pour the cornbread into a 10-inch cast iron skillet. Bake for 15 to 18 minutes, or until the cornbread is just set. Remove it and poke holds into the bread. Drizzle a 1/2 cup or so of the the enchilada sauce overtop of the cornbread. In a bowl, stir together the chicken, green chiles and the corn. Stir in the remaining enchilada sauce (or at least a cup or so of it) and 2 ounces of the cheese. Spoon it on top of the cornbread base. Cover with any extra enchilada sauce and the remaining cheddar. Bake for 25 to 30 minutes, until golden and bubbly. Remove from the over and cover with the green onions and cilantro. Heart just skipped a beat. YUM – so on board with eddie on this one, looks AMAZING. i love keeping these kinds of cheesy skillet dishes in my back pocket for thanksgiving leftovers – we’re going to LOVE this one! Definitely adding this to our menu this week! Yum! You had me at cheesy! So fun! I love trashing up my cornbread with chili or soup so this is right up my alley! I have been making a cheaters tamale pie with boxed cornbread for forever and it’s a family favorite – i don’t know why it’s so good, but it just is! this looks like an awesome upgrade! YES!!! This looks absolutely incredible! OHMYGOSH. Yum. This looks soooo good! I make a chicken nacho pie, but I’ve never made a tamale pie before! wow, homemade enchilada sauce too, love the base, what a creative way to make and serve a tamale, thank you for this recipe! Absolute perfection!! I made it using chicken I made in the crockpot with garlic salt, pepper, cumin, onion powder, garlic powder, smoked paprika, oregano, and cayenne…cooked with a bottle of Modelo! This will be in regular rotation. It’s SO worth the extra work to make the cornbread and enchilada sauce from scratch! yay! so glad you made it and loved it! I made the Cheesy Chicken Tamale pie for dinner last night. Love the homemade enchilada sauce !! I will be using it in other dishes too. OMG, all the love for messy/gooey/sloppy plated dishes!!! They just taste that much better in my mouth. :-D This looks amazing for during our fall weather here in Chicago! Thanks! This is fantastic! I didn’t have any cooked chicken so I baked a large boneless skinless breast with a sprinkle of chili powder while I cooked the sauce. Loved the contrast of the cornbread with the chicken mixture – it was a little drier and grittier than I might make plain but it was perfect in this dish. So good! Just made the shortcut version. We just came home from a long weekend at the coast and I needed to fix something, but didn’t want to spend a ton of time. Picked up already shredded rotisserie chicken from the grocery and a can of Hatch red enchilada sauce and a box of gluten free cornbread mix and a package of already shredded sharp white Tillamook cheddar. I appreciated it was so easy to put together. Added the can of Hatch green chiles too. Can’t wait to try it. Thanks! WOW sounds tasty. I just love cheese and must try deiffent cheese recipes. Adding this into our weekly rotation — its SO delicious! Quite easy, too! MAKE THIS! I used canned enchilada sauce to speed up the process and had slow cooked chicken on hand. WINNER WINNER chicken dinner. Thanks for a great recipe! Really tasty combination and the home made sauce is especially flavorful. I substituted olives for the corn (didn’t want to make a trip to the store). this is sooooo good and I crave it all the time! REALLY great as leftovers too! Made this for dinner last night and it was a huge hit! If we don’t have a cast iron skillet, what would you suggest doing? Loved this recipe! I actually just mixed the cornbread up right in the pan then drizzled a little oil around the edge. Baked wonderfully, did not stick and saved me a bowl! This is the 3rd time I’ve made this, and we love it! I use sharp cheddar and pepper jack just for personal preference. Thank you for the delicious recipe! So good! But, my cornbread turned out pretty dry. Did I do something wrong? I followed the recipe exactly. Maybe it was the brand or type of cornmeal? Will try it again! Looks amazing and delicious recipe. Will try it for my family. Hope they will love it. Thanks! The enchilada sauce and the chicken topping were a big hit. My cornbread did not turn out so well – it was salty yet bland, and there was a little bit of an acrid taste from the baking powder. For the enchilada sauce, I used fresh onion and garlic rather than powders, blitzed them in my mini-chopper for a smooth consistency, sauteed them in the olive oil for a bit before adding the dry spices (to bloom their flavors), and then added the flour to make the roux. Cooking the roux for several minutes really makes a difference in the depth of flavor! I added corn kernels and black beans to the topping mix to stretch it. The topping and sauce are also great served with brown rice instead of cornbread! This was out of this world good. I went the cheater way with the corn bread but not with the enchilada sauce. Followed the recipe the rest of the way. My husband requested this to be made again. And I agree!!! !